The ARi is a group of major research projects which focuses on permanence planning, matching, support for adoptive placements and the costs of adoption. The ARi was commissioned by the former Department for Education and Skills. The dissemination and implementation programme has been funded by the Department for Education. The findings from the projects hold key messages for all who are concerned with securing permanence and stability for children who cannot live with their birth parents. Click here for more information about the background to, and aims of, the ARi. 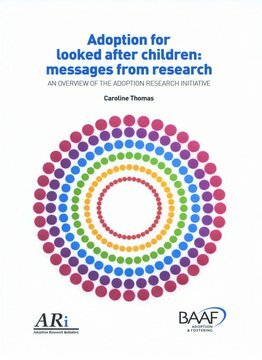 Adoption for looked after children: messages from research: An overview of the Adoption Research Initiative has been published. Click here to download. Hard copies of the book are also available from BAAF’s bookshop. These are 4/5-page documents giving key findings and messages for practice. Ten of the eleven have now been published. Longer summaries - a full set is now available. Details of the availability of full reports from BAAF. The ARi has completed and BAAF has assumed responsibility for the long-term maintenance of this website. If you have any queries about its content or functioning, please contact BAAF.